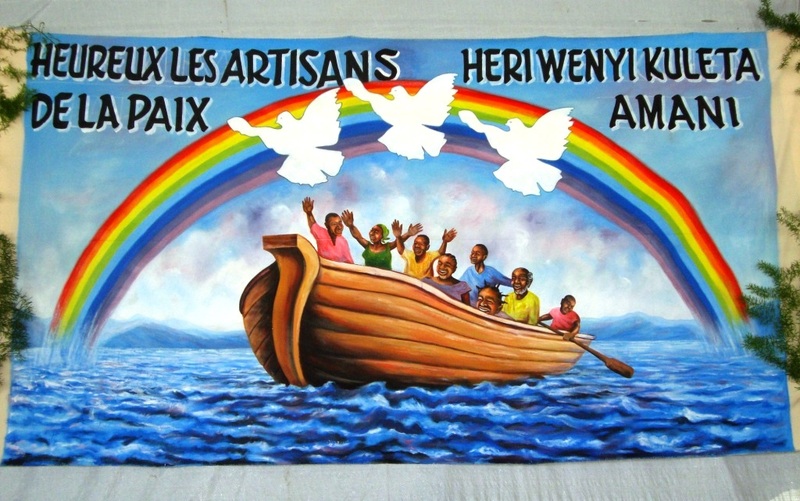 Peace in the Great Lakes is the name of the Ecumenical campaign for Justice, peace and reconciliation by the Catholic and Anglican bishops from Burundi, Congo and Rwanda. The campaign aims at building peace by conversion of heart, consolidation of the peace acquired by recent cessation of war, and promoting reconciliation and fraternity. These will be achieved through concerted effort between Anglicans and Catholics in spearheading peace initiatives, lobbying, sensitization, and joint social, cultural and productive activities. The Campaign was launched in Goma on Sunday, 1st December 2013, during an ecumenical prayer of Catholics and Anglicans from the three countries. The ceremony began at Congo-Rwanda border of Gisenyi, where delegates from Burundi and Rwanda were welcomed as sign of brotherhood without barrier. From there the procession traversed the town of Goma to John Paul II Grounds where the prayer took place. At each of the three stations a prayer was pronounced for a specific intention. Indeed, such floral beauty manifested itself when double files of both Anglican and Catholic priests and bishops, in their proper robes but same stoles, ascended to the podium. By this peace initiative the bishops responded to the people longing for peace after traversing the horrors of the genocide of over a million persons in Rwanda, the murders in Burundi, and the massacres of over six millions Congolese. Thus, Advent is the ideal occasion, a period of awaiting the prince of peace who comes to inaugurate the new social order where instruments of war are transformed into instruments of production (cf. Is 2:4) and the people invited to abandon totally the acts of darkness (cf. Rm 13:12). The bishops call the perpetrators of conflict to cease evil (cf.Is1:16-17) and the entire population to move ahead despite their situation as inspired by Africae Munus: “Rise up, take your mat and walk” (Jn 5:8). The people are tired of the recurring violence and bloodshed, fuelled by manipulation of tribal and national identities for selfish motives. They are tired also of the paradox of their lives; in the midst of abundant riches they live in abject poverty. Hence, there is need for conversion of heart, especially in naming things as they really are instead of settling on systematic deceit. The bishops sound the warning: “Woe to those who call evil good and good evil….” (Is 5:20). And they remarked also that on the interpersonal relations between ordinary people of the three countries there is no enmity as such; the problem lies on the level of politicians and the elite who profit from the conflict. Hence, the heads of states are invited to commit themselves honestly in the pursuit for peace. By this campaign the bishops hope for a new generation of Burundians, Congolese and Rwandese, not opposed as enemies, but who look in the same direction as brothers and sisters despite their different ethnic identities. After this message of the bishops the apostolic creed was recited, then the prayer of peace: Make me an instrument of peace. The intercession took the form of a message of one country to another, exposing the situation as it is, then concluding into prayer of hope for new relationship. First, it was the message and prayer by Congo for Burundi, Burundi for Congo; Rwanda for Burundi and vice versa; Rwanda for Congo and vice versa. Then, the sign of peace. The campaign was launched with a release of six doves, then the final blessing was given by all bishops together. 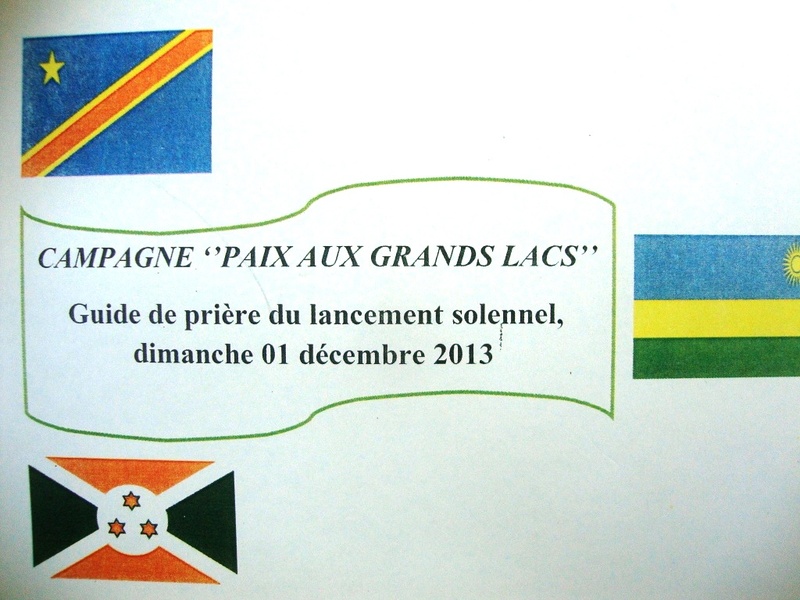 The next rendezvous is December 2014, in Goma, to close this year-long campaign. Lord, consolidate peace in our land is a catch phrase of this ecumenical prayer. Indeed, wherever we are, let us pray for peace in this region.